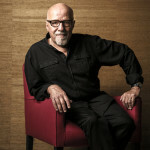 Once upon a time, when he was in his teens, the now best selling author Paulo Coelho (pictured on the right by Niels Ackermann/Rezo for The Wall Street Journal), was committed to a mental institution. By his parents. Three times. He had electroshock therapy. And escaped. Twice. My 2¢: What if that was the only story that Paulo Coelho ever told?